ROGUE CLASSICISM: Returning to the Gospel of Jesus’ Wife: Reflections and Implications (I). David Meadows provides some reflections, some background, and a helpful timeline of events. By the way, the penny only dropped for me this morning that Ariel Sabar, the author of the recent Atlantic article, is the son of UCLA Aramaist Yona Sabar and the author of My Father's Paradise, on whom and on which more here and links. Many, many past posts on theGJW are here and links. NAASCAL: “Fakes, Forgeries, and Fictions” Preview: Caroline Schroeder’s “Gender and the Academy Online.” A forthcoming article on the now pretty-much settled Gospel of Jesus' Wife controversy, on which much more here and here and links. The article went to press before the recent revelations by Ariel Sabar. Some past comments by Professor Schroeder on the GJW were noted here. ANOTHER DIGITIZATION PROJECT: Dan Brown Donates €300,000 to Digitization Project at the Ritman Library (NATE PEDERSEN, Fine Books Magazine). Novelist Dan Brown, known for his runaway bestseller The Da Vinci Code (2003), has donated €300,000 ($338,000) to the Bibliotheca Philosophica Hermetica, aka The Ritman Library, in Amsterdam. The money will be used to digitize the library’s core collection of about 4,600 early printed books (pre-1900) and about 300 older manuscripts. Once they are digitized, the collections will be freely available online on the library’s website. The Prins Bernhard Cultuurfonds also contributed €15,000 to the project. The Ritman Library was founded by Dutch businessman and book collector Joost Ritman in 1984. The library specializes in hermeticism, as well as the related fields of Rosicrucianism, alchemy, gnosis, esotericism, and Kabbalah and is widely considered one of the finest collections of its type in existence. Dan Brown has his good points and his bad points, but in this he has done a good thing and I commend him. My review of The Da Vinci Code novel is here and of the movie is here. And for the 2006 copyright lawsuit against him by Michael Baigent and Richard Leigh, co-authors of The Holy Blood, and the Holy Grail, which Brown won, see here with lots more in the searchable PaleoJudaica archive. I've enjoyed his novels, but he shouldn't insist that they are based on FACTS. The movies have been better about this. READING ACTS: The Dream Visions (1 Enoch 85-90) and the New Testament. Past posts in the series, plus on related matters, are here and links. I'M BACK IN ST. ANDREWS. Got in last night, after a few travel close calls and mixups that will make for entertaining stories, even if they weren't particularly entertaining at the time. Great conference. More on it later. JAMES MCGRATH: John the Jew: The Last Day of the 2016 Enoch Seminar Nangeroni Meeting. James's report on the discussion during the fourth day of the conference. I have some notes on the conference too, which I will try to work up into a blog post in the next few days. 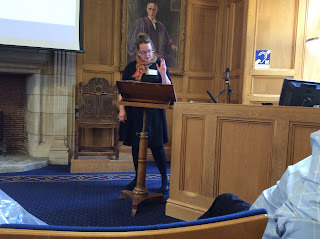 Meanwhile, previous posts on the John the Jew Seminar are here, here (my summary of the St. Andrews Divine Sonship Symposium), here, here, here, and here (my response to Catrin Williams's paper), with links to the other conference posters. READING ACTS: The Animal Apocalypse, Part 1 – 1 Enoch 85-90. Past posts in the series, plus on related matters, are here and links. H-JUDAIC: Conference: The Talmud and Christianity (Cambridge University, June 27-28). THE ANCIENT BOOKSHELF: A Critical Edition and English Translation of the Classical Ethiopic Commentary Materials on the Book of Daniel (James Hamrick). Catrin Williams has set out to advance our understanding of John’s exegetical use of the Septuagint version of Isaiah, drawing especially on insights into the translation technique of the Greek translator and ways in which the translation reformulates the text of Isaiah so as to create, whether deliberately or otherwise, internal connections of potential messianic interest which are not present in the Hebrew text. In part one, she focuses in particular on the two quotations of Isaiah, 53:1 and 6:10 which appear in John 12:38-40. The Hebrew text already provides catchword links between the two verses and the Septuagint translator has created more links between the two passages containing the verses and has otherwise set the stage for a Christological reading of them. Catrin argues, convincingly in my view, that the translator sets the stage for John’s key theological theme of “humiliation as exaltation” as applied to Jesus. In part two she argues that, by “streamlining” the translation of some passages, the Septuagint translator opens potential catchword connections between passages with no such connection in the Hebrew text, and John seizes on some of these in his use of Isaiah. The key Greek terms include “glory” (δοξα), “exalt” (υψοω), and “light” (φως), and the new connections serve to create a closer link between God and the Servant, and therefore for John, God and Jesus. Of particular interest is the Septuagint’s treatment of the phrase “the arm of the Lord,” which features in 53:1 and is a characteristic phrase of the Book of Isaiah. Catrin argues, again convincingly in my view, that John’s familiarity with the Greek text of Isaiah has paved the way for him to read Jesus to be “the visible embodiment of ‘the arm of the Lord.’” Some passages in the Greek text hint at a close connection between the arm and the servant and this catchword connection of Isaiah 52:7-15 with Isaiah 40:9-11 informs John’s use of Zechariah 9:9 in John’s account of Jesus’ triumphal entry into Jerusalem. In addition the language of the Greek of Isaiah 43:10 makes the Lord a co-witness with the servant and opens up the possibility of an association of both God and the servant with the Greek divine title εγω ειμι, “I Am,” and the Greek text of this verse informs Jesus’ important Christological declaration in John 8:28. The third section of the paper explores the reception of the book of Isaiah in the Parables or Similitudes of Enoch alongside its reception in the Gospel of John. The Parables have little in the way of overt allusion to Isaiah 6, but they show considerable interest in the Servant Songs, applying the titles Chosen One and Righteous One to the Son of Man figure and regarding him as the chosen but hidden light of the nations, now pre-existent. But, unlike the Christian interpreters of the Servant Songs, the Parables apply the humiliation of the Servant to the chosen and righteous ones on earth, not to the exalted Son of Man figure. Although John and the Parables share, as Collins put it, “belief in a hidden world where the power structures of this world are reversed” and both view this world, at Catrin puts it, as “filtered through an Isaianic lens,” the Parables present this reversal eschatologically with the enthronement of the Son of Man, whereas John presents it — with the help of Greek Isaiah — in terms of humiliation as exaltation. Catrin’s paper is an important piece of work that improves our understanding of the origins and background of John’s Christological theme of humiliation as exaltation and places it in a larger context in Second Temple Judaism with the comparison to the messianic exegesis of Isaiah in the Parables of Enoch. I find her arguments and conclusions persuasive and I have no criticisms worth mentioning. Rather than looking for details to nitpick, I want to mention two areas of potential interest in relation to her paper, one as additional background to Second Temple Jewish exegesis of Isaiah and the other involving some observations concerning how her conclusions might help us understand another messianic controversy in late antiquity. Firstly, a central concern of Catrin’s paper is how the translation decisions of the Septuagint translator facilitated the construction of John’s Christology. It is difficult to know how many of the messianic implications of the translation decisions were deliberate, but it is hard to image, for example, that the translator did not intend to emphasize and consolidate the relationship between God and the Servant in Isaiah. It is worth noting that there is some evidence for similar exegesis in the scribal treatment of the Hebrew text of Isaiah. In a number of cases readings found in the larger Qumran Isaiah Scroll (1QIsaa) seem to shift the text in a more messianic direction. In Isaiah 7:14 the Lord, rather than his mother, is the one who names (וקרא) the child Immanuel. In Isaiah 61:1, with the omission of a verb and the addition of a conjunction, the anointing of the speaker is tied directly to his power of healing. And in 53:14, rather than the Servant’s appearance being marred, we are told that God has anointed (משחתי) his appearance. And so on. And, in light of Catrin’s paper, it is perhaps of interest that, with the Septuagint but against the MT, 1QIsaa, IQIsab, and 4QIsaa tell us in 53:11 that the Servant will see light (אור). I do not know if anyone has done a comprehensive analysis of potential messianic exegesis in the readings of the Qumran Isaiah scrolls — probably someone has — but if not, this seems worth doing. The examples above underline that Second Temple-era exegesis of scripture involved not only commentary on the text, but the transmission of the text itself, a point important for Catrin’s paper. Secondly, in one of the last sessions of this conference it is perhaps worthwhile to move the discussion briefly in the direction of late antiquity and ways in which the Christology of John may have influenced Jewish and Christian interactions over messianic theologies. Peter Schäfer has argued that the book of 3 Enoch, with its remarkable quasi-divine figure of Metatron, was a late antique Jewish response to Christian appropriation of Jewish messianic themes, a response that offered another messianic figure who was a divinized man who acted as savior and celestial judge, but who was not pre-existent and whose exaltation was not tied to a humiliating death. * The book of 3 Enoch and its figure of Metatron were clearly influenced on some level by the Parables of Enoch and its Son of Man, so bringing it in here is not entirely irrelevant to Catrin’s inquiries. And as I was reading her paper, a number of interesting connections between her conclusions and 3 Enoch occurred to me. The figure of Metatron in 3 Enoch, like the Son of Man in the Parables, is a chosen one (6:3), who is lifted up off the earth in great glory from a corrupt generation (chapter 5 and 6:1), after which he is enthroned on his own throne in heaven (10:1-6). Metatron also has parallels with the Christ of the Gospel of John in his exaltation in glory and his divinization as the Lesser YHWH. But this positive picture of Enoch-Metatron is to a large degree rejected in 3 Enoch from the point of his dethronement in chapter 16 onward. From that point he functions almost exclusively as the interpreting angel for R. Ishmael’s tour of heaven. The Book of 3 Enoch quotes and alludes to the book of Isaiah extensively and it would be worthwhile for someone to explore its exegesis of Isaiah in depth. But a few points are worth raising here. Unlike in the Similitudes, Isaiah 6:2-3 is quoted or alluded to a number of times in 3 Enoch (1:12; 19:7, 20:2, 24:3; 35:6; 40:2) but, unlike the use of the chapter in John, the passage is used essentially to provide details about the heavenly realm. More interestingly, 3 Enoch makes extensive use of the Isaianic passages about the arm of God, incorporating them into its theology of the right hand of God, which (on the basis of an old midrash) remains bound behind his back until the eschaton, when it acts to bring deliverance to Israel. His right hand is mentioned first in 3 Enoch 44:7, combining an allusion to Isaiah 42:5 (the only reference to a Servant Song in the book) with the creation of the heavens and earth by it in Isaiah 48:13. The highest density of references is in the appendix chapter 48A of 3 Enoch, where God’s released right hand becomes the arm of the Lord bringing God’s deliverance according to Isaiah 51:9, 63:12, 59:16, 63:5, and 52:10. The emphasis is on the arm of the Lord as God’s instrument and there is no messianic sense attached to it. Indeed, the passage emphasizes (v. 8) that God is acting to prevent profanation of his name. The passage concludes in 48A:9-10 with the revelation of the arm of the Lord, “and the appearance of its splendor is like the splendor of the light of the sun in its might at the summer solstice.” Israel is then redeemed from among the gentiles, the Messiah comes and brings them up to Jerusalem with great joy and feasts with them. The peoples of the world are either invited or not, depending on which textual variant one accepts. The passage concludes with quotations from Isaiah 52:10; Deuteronomy 32:12, and Zechariah 14:9, asserting that the arm of the Lord and God’s deliverance will be manifest before the nations, no foreign God shall be with him, and the Lord will be king over the whole earth. At minimum this passage independently collects numerous scriptural themes also used by John. But is it possible that the connection is more direct? This appendix to 3 Enoch makes God’s arm his instrument at the eschaton and associates it with glory and light and the prevention of the profanation of God’s name, while carefully separating it from the Messiah. The Messiah brings Israel to Jerusalem joyously in what could be called a triumphal entry, but one in which the gentiles are at best subservient and at worst not invited at all. This almost reads like a rejection of John chapter 12, in which Jesus leads his followers joyfully into Jerusalem, where he is glorified and glorifies God’s name. He is the light of the world, at least implicitly he acts as the arm of the Lord, and the gentiles at the feast of Passover who ask to see him are not rejected. If more parallels to New Testament passages with this level of detail can be found in 3 Enoch, I may yet find myself persuaded by Schäfer’s theory. Meanwhile, let me thank Catrin for her stimulating paper, which has advanced our understanding of John’s use of the Greek scriptures to construct his Christology and has helped place his use of Isaiah in the context of Second Temple-era Jewish exegesis. It has also stimulated me to think about some tangentially related matters in new ways and I am grateful for that as well. *Schäfer, The Origins of Jewish Mysticism (Tübingen: Mohr Siebeck, 2009), 315–327, 330; idem, The Jewish Jesus: How Judaism and Christianity Shaped Each Other (Princeton: Princeton University Press, 2012), 103–149. Divination is a topic which has enjoyed a growing amount of attention in contemporary scholarship, especially the relationship between divination and prophecy in the Hebrew Bible. Scholars now recognise that ancient prophecy was not an isolated phenomenon; it existed within a larger complex of religious ideas, symbols and practices related to communication between humans and gods. In Mantik im Alten Testament, Rüdiger Schmitt examines the practitioners, instruments and discourses related to divination in the Hebrew Bible. Schmitt is already a contributor to this area of research, e.g. as with his Habilitationsschrift published as Magie im Alten Testament (AOAT 313, Münster: Ugarit-Verlag, 2004). These two works are closely related; as he notes in the foreword, Mantik im Alten Testament is like a companion volume to Magie im Alten Testament. Schmitt has tried to avoid redundancies in Mantik im Alten Testament by referring the reader to his 2004 work for fuller discussions of research and method. This aim is understandable, though it does weaken Mantik as a standalone work. Still, interested readers will find a great deal of useful information distilled into this handy volume. 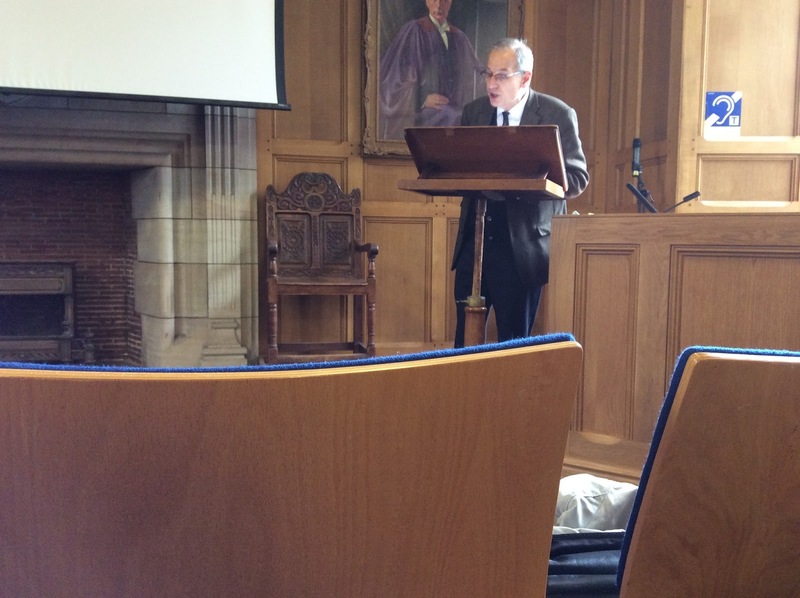 JAMES MCGRATH: John the Jew, Kingship, Priesthood, and Divinity: Enoch Seminar Day 3. James's report on yesterday's discussion. Previous posts on the John the Jew Seminar are here and links. READING ACTS: The Dream Visions – 1 Enoch 82-83. Past posts in the series, plus on related matters, are here and links. CSTT BLOG: CFP: “KINGS AND POWER: EXPLORING JEWISH TEXTS IN THEIR HELLENISTIC CONTEXT” (HELSINKI, 3-4 DEC. 2016). The Academy of Finland Centre of Excellence “Changes in Sacred Texts and Traditions” aims at a more comprehensive understanding of the emergence and influence of the Hebrew Bible/Old Testament and other ancient Jewish literature within the multicultural milieu of the ancient eastern Mediterranean region. It provides an interdisciplinary approach to cultural, societal, ideological, and material changes in the period when the sacred writings of Judaism were created, transmitted, and continuously transformed. The researchers of the CSTT examine ancient Jewish texts from the point of view of archaeology, sociology, and history of religion, to mention but some of the most influential methodological frameworks. JAMES MCGRATH: John the Jew and Torah Observance: Enoch Seminar Day 2. James's report on yesterday's discussion. The Twitter hashtag for this Enoch Seminar is #johnthejew. You can also see the tweets collected at the Enoch Seminar Twitter feed. ALIN SUCIU: Report on the International Conference “Shenoute and the Bible” (Göttingen, May 17-21, 2016). The conference was noted as upcoming here. Cross-file under Coptic Watch. PUNIC WATCH: Sunday's huge battle on 'Game of Thrones' was partially inspired by a real Roman fight (Kirsten Acuna, Tech Insider). Also, at Time Magazine Melissa Chan provides a quotation from Polybius describing the ancient battle: Here’s the Real History That Inspired the Game of Thrones ‘Battle of the Bastards.’ Past posts involving the Battle of Cannae are here, here, here, here, and here. THIS DAY IN JEWISH HISTORY: 1924: The Priest Who Noticed Jesus Had Been Jewish Is Born. Geza Vermes was born Jewish himself, became a Catholic priest, but came back to Judaism, and Jesus (David B. Green, Haaretz). June 22, 1924, is the birthdate of Geza Vermes, the Hungarian-born scholar who was among the first to study Jesus as a Jew, and was also one of the first academics to write about the Dead Sea Scrolls. Vermes himself also had an unusual spiritual journey, which included a spell as a Catholic priest before his return to Judaism. Vermes was on the faculty of the University of Newcastle from 1958 until 1965, when he was invited to Oxford University, becoming first professor of Jewish studies at Iffley (later, Wolfson) College there. Later, he helped found what is now known as Oxford’s Center for Hebrew and Jewish Studies. He also published the first English translation of the Dead Sea Scrolls, in 1962 (unfortunately, the first edition had an upside-down image of a scroll page on its cover), revising it several times over the next half-century. His first book about Jesus, “Jesus the Jew,” was published in 1973, and was followed by several other books looking at the Jewish origins of Christianity. Vermes died on May 8, 2013, at age 89. Read it all for lots more on Professor Vermes's interesting life. Background here and links. MARINE ARCHAEOLOGY: Bones of Extinct Fish Found in Shipwreck Off Israel's Coast. Geneticists identify bones in 7th-century vessel as belonging to subspecies of tilapia, aka St. Peter's fish, usually a fresh-water species (Nir Hasson, Haaretz). Genetic tests conducted on fish bones found in a shipwrecked vessel off the coast of Israel, south of Haifa, indicate that a now-extinct subspecies of tilapia existed as early as 1,300 years ago in the country. The seventh-century ship (from the early Islamic period) was found in the Mediterranean Sea about 100 meters away from Dor Beach, at the foot of the Carmel Mountains. The species of tilapia that still exists in Israel, and popularly called St. Peter's fish (musht, in Hebrew), typically lives in fresh water. MARK GOODACRE: Gospel of Jesus' Wife: Last Chapter Round-Up. At the NT Blog, Mark reports the statement from the Harvard Divinity School and rounds up articles, an interview of himself with CBN, and blog posts. JAMES MCGRATH: John the Jew: The 2016 Enoch Seminar in Camaldoli, Italy. James gives a report on the first day of the Seminar. My report on the St. Andrews Divine Sonship Symposium has been posted here. James mentions that Shayna Sheinfeld is tweeting the conference. So is Meredith Warren. If anyone else here is posting on social media, drop me a note or grab me in person and tell me so I can mention you. THIS WEEK'S DAF YOMI COLUMN BY ADAM KIRSCH IN TABLET: Toward a Taxonomy of Damage. The Talmud is what happens when the laws of the Written Torah are not sufficiently broad or abstract to serve as the basis for a functioning legal system. HISTORY AND LEGEND: This Day in Jewish History 1565 BCE: Judah Is Born, Will Found a Mighty Kingdom. Did Judah really exist? Archaeological evidence is scanty but what there is can support biblical tales of migrations and travails (Ruth Schuster, Haaretz). For all Judah's colorful stories – which include magnanimously orchestrating the sale of Joseph by the jealous brothers to the Egyptians rather than killing him, being anointed leader of the house of Israel by his father Jacob, and having five sons including Ur and Onan – some scholars suspect his existence is a figment of rewritten history, to explain in retrospect why the tribe of Judah became ascendant over the other 11. That pretty much sums it up for any historical Judah as a person, but there is archaeological evidence for Judah the kingdom and perhaps some indirect information relevant to Judah the tribe. Read it all before the subscription wall comes down. BIBLIOGRAPHIA IRANICA: Iranian Studies in Honor of Pierre Lecoq. Notice of a new book: Redard, Céline (ed.). 2016. Des contrées avestiques à Mahabad, via Bisotun. Etudes offertes en hommage à Pierre Lecoq. (Civilisations Du Proche-Orient Série III. Religion et Culture 2). Paris: Recherches et Publications. Ancient Judaism receives at least a little attention in the volume. Ezekiel studies are flourishing. The 27 essays collected in this volume were first presented in a series of special sessions under the title “Ezekiel in International Perspective” at the Society of Biblical Literature conferences in St Andrews and Vienna. The principal aim was to widen contact, cultivate understanding, and foster collaboration between international colleagues who, though working on the same ancient text, possess diverse points of view and operate from different methodological frames. The meetings allowed moments of introspection, providing the freedom and opportunity to reflect on questions of appropriate evidence, suitable methodology, and argumentative plausibility, by juxtaposing papers from diverse perspectives. The resulting collection is a portrait of the discipline in the present and a prospectus for future research. Most scholars of the Hebrew Bible/Old Testament recognize Ruth's simplicity and beauty, yet there has been little consensus in critical scholarship related to the book's origin and purpose. Opinions on the text's date range from the early monarchic period down to the Post-Exilic period, and interpreters argue over whether the narrative served to whitewash David's lineage, or if it held Ruth out as a positive example of Gentile inclusion in the Judean community. With an eclectic approach drawing on traditional exegesis, analysis of inner-biblical allusions, comparisons of legal and linguistic data, and modern refugee research, Edward Allen Jones III argues that Ruth is, indeed, best understood as a call for an inclusive attitude toward any Jew or Gentile who desired to join the Judean community in the early Post-Exilic period. Within the narrative's world, only Boaz welcomes Ruth into the Bethlehemite community, yet the text's re-use of other biblical narratives makes it clear that Ruth stands on par with Israel's great matriarchs. Though certain segments of the Judean community sought to purify their nation by expelling foreign elements in the Restoration period, Yhwh's loving-kindness in Ruth's life demonstrates his willingness to use any person to build up his people. AS PROMISED, here is the text of the report on the Symposium which I presented this morning at the Sixth Nangeroni Meeting of the Enoch Seminar in Camaldoli, Italy. I should begin by noting that the St. Andrews Symposium for Biblical and Christian Studies was created solely by the postgraduate students at the Divinity School of the University of St. Andrews some years ago and they have been entirely responsible for organizing and running each symposium. Past symposia have been held on Authoritative Texts and Reception History (2011);, Manuscripts and their Texts: Perspectives on Textual Criticism (2012); Sacred Texts in Their Social-Political Contexts (2013); and Ancient Readers and Their Scriptures (2014). Essays from the first symposium are forthcoming in a conference volume. This year’s combination of numerous papers by postgraduates alongside a stellar cast of senior presenters is characteristic of these symposia and underlines how important and successful they have been. The third plenary paper was by Professor Menachem Kister of the Hebrew University, who spoke on “Son(s) of God: Israel and Jesus.” As the title implies, his paper compared the concept of divine sonship as applied to Jesus, to the early followers of Jesus, and to the people of Israel, citing a vast range of evidence including the New Testament, Second Temple-era Jewish literature, rabbinic texts, Syriac-speaking Christian writers, and even Sa’adia Gaon, and giving attention to the various ways that passages in the Hebrew Bible were deployed by the individual writers to support their theologies of divine sonship. The final plenary paper on Monday was presented by George Brooke, the recently retired Rylands Professor of Biblical Criticism and Exegesis at Manchester University. I had the pleasure of introducing him. 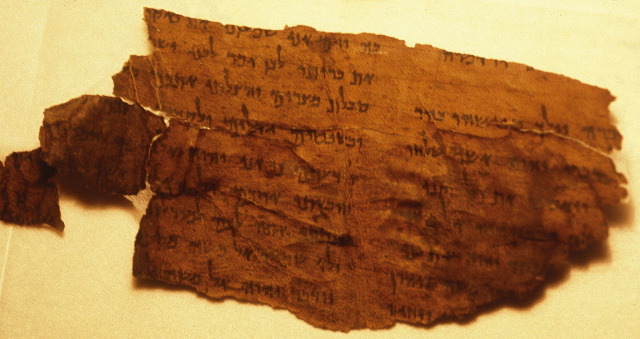 He spoke on “Son of God, Sons of God, and the Elect in the Dead Sea Scrolls.” The so-called Son of God text from Qumran, 4Q426 ar featured importantly in his paper. (The “ar” indicates that the text is in Aramaic, but this led to a number of pirate jokes during the course of the Symposium. *) Professor Brooke argued that the positive interpretation of the son of God figure in this text in some sort of messianic sense remains a live option. On Tuesday the fifth plenary paper was given by Michael Peppard of Fordham University. He spoke on “Son of God in Gentile Contexts (i.e., Almost Everywhere)” and argued for the importance of the emperor cult as background to the divine sonship of Jesus, drawing on an inscription dedicated to Tiberius Caesar from 29 C.E. (IGR III 933 = OGIS 2.583), which treats Tiberius as a god, a son of god, and a high priest, themes important in the New Testament traditions about Jesus. Professor Peppard also called on scholars to develop imaginative scenarios to understand better how, say, a Christian might feel socially compelled to participate in the emperor cult because his brother-in-law invited him to join in as he was passing a sacrifice on the street. 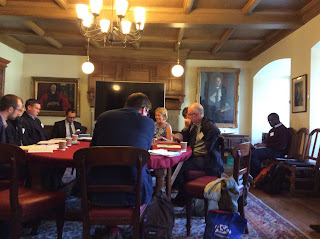 The sixth plenary paper was by Dr. Matthew Novenson of the University of Edinburgh, who spoke on “Whose Son is the Messiah?” Unfortunately, I have no notes or handout for this one, but Chris Porter has posted some comments on it. See the link to his second post below. On Wednesday, the seventh plenary paper was by Professor Reinhard Kratz, of Geoge-Augustin Universittät, Göttingen, who spoke on “Son of God and Son of Man: Reflections on 4Q246 in the Light of Daniel 7 and Psalm 2.” Based on the use of these scriptural passages in 4Q426, he argued for an interpretation of the son of God in the text as an evil figure. In plenary paper eight, Professor Jan Jooston of Oxford University spoke on “He Boasts that God is His Father: Wisd 2:16-17 between Ps 22:9 and Matt 27:43,” exploring the meaning of the concept of divine sonship in Wisdom in the light of this and other passages and their scriptural backgrounds. The ninth and final plenary paper was by Professor N. T. Wright of the University of St. Andrews, who spoke on “Son of God and Christian Origins.” He suggested that in early Christianity divine sonship language referred to Israel’s Messiah (but not necessarily as a divine being); Jesus’ followers; and Jesus as the living human embodiment of Israel’s God. The early Christians saw no conflict in these three senses and if we do, it may be our problem, not theirs. He concluded by saying that we scholars are good at analyzing the details of small textual fragments, but we must not forget to step back and look around ourselves at the larger picture. Time does not permit a detailed report on the many short papers delivered in three fourfold parallel sessions on Monday and Tuesday, and I was only able to attend a few of these. Not surprisingly, the Gospels, Paul’s letters, and the Epistle to the Hebrews received a good deal of attention. Second Temple Jewish and related texts were represented by papers involving the Septuagint, Philo of Alexandria, the Hermetica, the Qumran Prayer of Enoch (4Q369) and 4Q Instruction, the Gabriel Revelation, and Pseudo-Philo’s Biblical Antiquities. Applications of cognitive psychology, ritual studies, and the visual culture of Roman depictions of apotheosis brought some interdisciplinary perspectives into the discussion of Paul’s letters. Dr. Sarah Whittle, "Appointed Son of God in Power by his Resurrection from the Dead': Paul, Apotheosis and the Visual Culture of the Empire"
To sum up, let me go back to Tom Wright’s comment about the larger picture. I, and others I talked to, found that the most striking thing we came away with from the Symposium was just how big that picture is. Divine sonship was an important concept across the ancient Near East and the Mediterranean from at least the second millennium B.C.E. to the late Roman era and even beyond. It had many meanings and those meaning shifted from culture to culture, over time, and even synchronically and within individual cultures. This picture provides New Testament scholars with an embarrassment of riches for exploring the background of the subject, but also with an exacting challenge to maintain rigor and proceed with the utmost methodological caution. And it provides scholars in many fields with a wonderful opportunity for interdisciplinary dialogue. In closing, I want especially to thank the organizers of the 2016 Divine Sonship Symposium, Dr. Garrick Allen and Mr. Paul Sloane — along with the organizers of all the past symposia — for their leadership and also to congratulate them on the contributions these events have made to biblical studies and related fields. 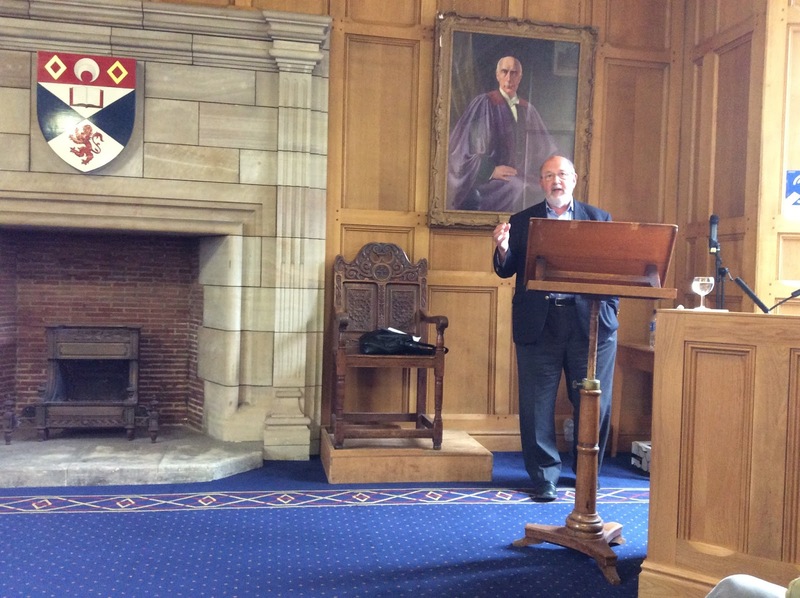 Another report on the St. Andrews Symposium on Divine Sonship has been posted by Chris Porter here and here [and, added later here]. *For pirate Aramaic, see here. UPDATE: I have corrected a link above and added another. THEATRE: Exagoge – The World Premier of an Ancient Play – Review (Rabbi John Rosove's Blog). It sounds a bit postmodern for my taste, but the ancient Alexandrians may have felt the same about Ezekiel's play. Cross-file under Old Testament Pseudepigrapha Watch. Background on this production is here. Follow the links there for past posts on the ancient play. READING ACTS: The Book of the Heavenly Luminaries – 1 Enoch 72-82. Past posts in the series, plus on related matters, are here and links. In this book, Louis C. Jonker considers more sophisticated and nuanced models for applying the heuristic lens of “identity” in the interpretation of the Hebrew Bible book of Chronicles. Not only does he investigate the potential and limitations of different sociological models for this purpose, but the author also provides a more nuanced analysis of the socio-historical context of origin of late Persian-period biblical literature by distinguishing between four levels of socio-historic existence in this period. It is shown that varying power relations were in operation on these different levels which contributed to a multi-levelled process of identity negotiation. Louis C. Jonker shows the value of the chosen methodological approach in his analysis of Chronicles, but also suggests that it holds potential for the investigation of other Hebrew Bible corpora. Taking on the established view of Chronicles, which uses retribution theology - the view that the author of Chronicles re-worked the texts in Samuel-Kings to demonstrate that Yahweh rewards the good and punishes the wicked - Troy Cudworth argues that this cause-effect relationship is maintained primarily through the treatment of the themes of war and temple-faithfulness. Cudworth identifies a division of kings into categories, with the immediate exception of David, who belongs in his own category as he pioneered the two most foundational elements of the temple cult. For this reason, he also won many battles to secure Israel's place in the land. The next two groups of kings can be dichotomised in the following way: those who show faithfulness to the temple cult and its practices, and those who neglect it. Based on their attitude to the temple, the Chronicler illustrates how the kings either prosper in the land through military victory or suffer attack. Although many kings begin as faithful in supporting orthodox temple practices, and thus prosper on the battlefield, none of these kings are consistent and persevere in their faithfulness and so their success either stops immediately, or they suffer attack. Conversely, other kings are illustrated who, despite committing some of the worst sins in Israel's history, repent immediately after their swift punishment. Across all of these cases, it is shown how temple faithfulness always ultimately guarantees peace and security for Israel. John J. Collins. Apocalypse, Prophecy, and Pseudepigraphy: On Jewish Apocalyptic Literature. Grand Rapids: Williamm. B. Eerdmans Publishing Co., 2015. 399 pp. $34.00 (paper), ISBN 978-0-8028-7285-2. The study of apocalyptic literature has progressed very far over the last fifty years, and no one is more responsible for the advances than John J. Collins. In this book, he presents us with twenty essays (most previously published; some new), organized into five categories: the relationships between apocalypse and prophecy, the apocalypse genre, conceptions of the End, the function of pseudepigraphy, and ethical and political problems of apocalyptic literature—with three to five essays in each section. Each essay not only presents Collins's conclusions but also explores how other scholars have reacted to his conclusions—so the book functions somewhat as a history of recent scholarship. This is nowhere more evident than in the introduction, which traces the discussion of the genre apocalypse from the seminal definition of the Society of Biblical Literature (SBL) genre project (1979) to the present, as a kind of autobiographical reflection that is both entertaining and informative—almost worth the price of admission all by itself. Earlier posts on the book are here and here. Prof. Em. Dr. Luc Dequeker (KU Leuven, Faculties of Arts and Theology) presents in this volume previously published articles and three new contributions concerning Jerusalem and the Jewish Temple. The first part concerns the rebuilding of Jerusalem and the restoration of the Temple after the Babylonian Exile. The second part deals with the cultural split in Jerusalem's temple milieu during the 'Maccabean' period. Two studies here deal with the site of the Syrian Aqra near the Temple and the site of the Royal Necropolis in the newly created 'City of David' on the Western Hill. The third part discusses the presentation in Jewish visual arts of the hoped for restoration of the Temple by the Messiah. The fourth part concerns the expectation of the New Jerusalem in Christian belief as reflected in the Book of Revelation and on the Ghent Altarpiece of Jan van Eyck. READING ACTS: The Parables of 1 Enoch and the New Testament. Past posts in the series, plus on related matters, are here and links. Some relevant past PaleoJudaica posts are here, here, and here.